I’ve always regarded Story as a powerful force, using that rather simplistic term as a catch-all for myth, metaphor, internal-dialogue and other aspects that I’ve rarely bothered to sit down and define. A while ago, when I first discovered this blogging business, I wrote an entry on the importance of Story to individuals and how an individual’s view of the world and their place in it is shaped by the stories they tell themselves inside their head. It’s also a contention of mine that if you understand the Story that a person uses, that has the most power for that person, it gives you a great advantage in understanding them and – for want of a less emotive term, though I do not mean the outcome is always intend to be unpleasant or controlling – manipulating/guiding them in a particular direction. Reading Dawkins’ “The God Delusion” recently (or re-reading it to be precise, or re-listening to it to be even more precise) the truth of this on a cultural level was brought back to me. Religious myths are the Big Stories after all and they are the ones with which we are surrounded from childhood. Whatever our personal reaction and response to the religious culture that surrounds us we cannot help but be shaped by it even if only on a reactionary basis. A jolly little song, about a jolly little incident. Joshua commanded the people, “Shout! For the LORD has given you the city! The city and all that is in it are to be devoted to the LORD. Only Rahab the prostitute and all who are with her in her house shall be spared, because she hid the spies we sent. It’s almost easy at that point to think how wonderful it is that the woman Rahab is being spared – and for her it is of course. But that little instruction in itself is actually an order to kill and kill and kill everyone else in the city. The fact that she’s singled out (and those with her) as the only ones to be spared means exactly that. Everyone else is to be massacred while the place is to be looted. See. No looting. Well, with one exception. All the silver and gold and the articles of bronze and iron are sacred to the LORD and must go into his treasury. I actually can’t bring myself to make any comment on that instruction that is any more amusing than letting it speak for itself. Dearie dearie me. Well how could they fail? God was with them of course. Every living thing. Men and women. Young and old. The invading army swarmed over the rubble, swords and spears in hand and they killed everyone. The men defending the walls, the women, children, babies, the elderly. Everyone. That was God’s instruction as relayed through Joshua. They even killed the animals because they were polluted and impure by virtue of belonging to the heathen inhabitants of Jericho. The silver, gold, bronze and iron treasures were presumably either less polluted and impure or.. perhaps.. so terribly terribly polluted and impure that the only safe place to put them was in the treasury where God (and his priests) could keep a close eye on them. But Joshua spared Rahab the prostitute, with her family and all who belonged to her, because she hid the men Joshua had sent as spies to Jericho—and she lives among the Israelites to this day. If I were in a fatuous mood I would say that unless saucy Rahab is still alive at the time I write this, then that little comment “she lives among the Israelites to this day” disproves the argument of Biblical literalists. Of course they would say that comment only applies to the time at which the book was written… and in that case how many other instructions… but no, I am being facetious here and there are too many serious points to make. That’s the lovely story of Joshua and the battle of Jericho that we sing about in Sunday School (well Finn never did, and is entertaining a gleeful inclination to rewrite the song with more appropriate lyrics). A couple of observations. First of all and most obviously, how can anyone draw anything positive from this macabre retelling of the butchery of an entire population? Secondly the defense that is is “Just a story” and that “times change” does not hold water. Story shapes culture, Story shapes thought. Tamarin read the story above, from the scriptures, to classes of children in Israeli schools who were presumably familiar with it anyway. He then asked them to respond whether they thought Joshua and his army had acted well, and respond A (Total Approval), B (Partial Approval) or C (Total Disapproval). -In my opinion Joshua and the Sons of Israel acted well, and here are the reasons: God promised them this land, and gave them permission to conquer. If they would not have acted in this manner or killed anyone, then there would be the danger that the Sons of Israel would have assimilated among the Goyim. -In my opinion Joshua was right when he did it, one reason being that God commanded him to exterminate the people so that the tribes of Israel will not be able to assimilate amongst them and learn their bad ways. -Joshua did good because the people who inhabited the land were of a different religion, and when Joshua killed them he wiped their religion from the earth. One Story cannot tolerate another it seems. Wiping out the Stories of a rival people helps destroy the people. -I think Joshua did not act well, as they could have spared the animals for themselves. 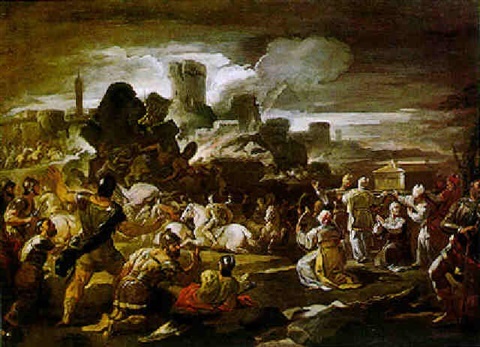 -I think Joshua did not act well, as he should have left the property of Jericho; if he had not destroyed the property it would have belonged to the Israelites. Does this mean that the children interviewed were particularly bloodthirsty? I doubt it. I shouldn’t imagine they were any more or less peaceful, violent, civilised or brutish than any children anywhere in the world. Nor do I speculate that the particular situation they were in – in a land riddled with violence – altered their perceptions too greatly. What we have here is the influence of Story on the minds of a culture, starting with the youngest but affecting everyone. This is a Story that marks one side (ours In-Group) as the good guys and the other side as Other, an Out-Group and therefore deserving of everything that happens to them. In-Groups by default have their actions justified by the power of Story – the actions themselves are less relevant than the In-Group membership. PreviousA Step Beyond Context – Amazon Sale!